Because surface energy is 1000x too small to be relevant to adhesion, why should we be interested in JKR experiments that just show surface energy?. Because JKR experiments are especially good at showing where real adhesion comes from and, using a complementary technique, can even give us a measure of the Adhesibility of a surface after we've treated it. The key idea is that if polymer chains from the rubber sphere start to intermingle with the polymer on the surface, then the JKR UNloading curve is very different from the loading curve - you need far more force to pull off the sphere. This is the start of real adhesion. To start playing, change the density of overlaps, Σ, and the length L of the overlapping polymer chains. Obviously the more overlaps we have (higher Σ) and the greater their length (larger L), the stronger the adhesion. The graph of contact width versus force for a system with just pure surface energy is the same when applying the pressure (load) and decreasing the pressure (unload). For many surface scientists any deviation from such a pure single curve would be a concern. For real adhesion it is necessary. Because during the loading the system can't "adhere" other than via surface effects, the load curve for adhesive surfaces is the standard JKR curve. But having been pressed together, the molecules at the surface might start to interact in ways not included in JKR theory. The most typical sort of interaction is "intermingling" - polymer chains in the two surfaces get a chance to move past each other. When it comes time to separate the surfaces it's quite difficult for the polymer chains to slip past each other so the contact width is larger for a given force and the force needed to separate the surfaces is larger. In other words, the unloading graph is shifted away from the loading curve and this shift is called "adhesion hysteresis". Naturally, the bigger the shift the bigger the adhesion. 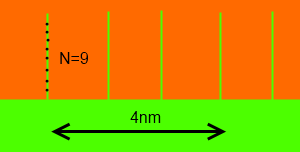 In this example, N=9 repeat units (chain length~1.4nm) and there are 4 polymer chains intermingling in 4nm (16 in 16nm2) making Σ=1/nm2. U is typically 3.5kJ/mole (divided by Avogadro's number). Focusing on the standard settings (a surface energy of 40dyne/cm is the default, along with a Radius of 20mm characteristic of classic JKR setups) we can play with two of the key variables. Σ changes from 0 to 2 (it is hard to pack chains tighter than 2/nm2 and N is calculated from the length of polymer chain, typically 0-5nm, and dividing it by a typical bond length of 0.15nm. As mentioned above, the value for U is fixed at a generally agreed value of 3.5kJ/mole which is a factor of 100 smaller than the energy of a C-C or C-O bond, a fact that will be important later in this book. In this plot the lower line is the loading curve, pure JKR, the upper line is the unloading curve which reflects the fact that there has been intermingling across the interface due to time, temperature and pressure before the unloading takes place. As you increase the link density or the length of the chains you see that the adhesion hysteresis starts to become large. The fact is that this intermingling sort of adhesion is a factor of 10 or more greater than surface energy adhesion. The initial boost to adhesion onto polyethylene from 0.03J/m2 to ~0.5J/m2 comes from the opening up of the surface (the PE is mostly a tight crystal which forbids intermingling) which allows intermingling. The surface energy itself increases only to 0.04 or 0.05J/m2 a trivial increase in adhesion which is irrelevant to practical adhesion. It is unfortunate that people tend to worry about the trivial increase in surface adhesion rather than the significant increase due to intermingling. We will see in the Real section that to get really strong (100J/m2) we need more than just intermingling. It's worth pointing out that even if there is chemical bonding involved, intermingling is just intermingling so not very impressive. 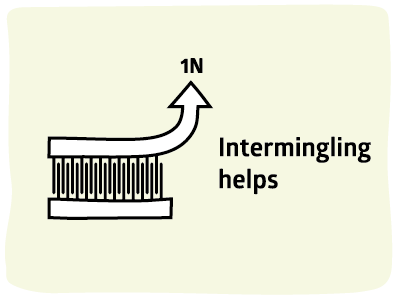 In the figure, the polymer chains are chemically bonded to the lower substrate, but that doesn't stop the upper substrate from sliding over the nails. Or to put it another way, if you want to join two pieces of wood firmly together you don't use nails (intermingling) you use screws (entanglement). If you come here from the Adhesibility page then you will be interested in the practicalities of the rubber spheres uses in your tests. These are likely to have a smaller Radius, which means smaller forces and, therefore, more delicated force transducers, closer to those in a nanoindenter.